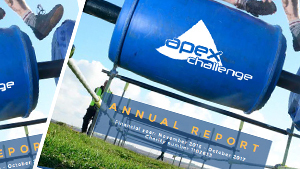 2017 was a strange year for the Apex Challenge with the difficult decision to cancel our event planned for October at short notice. As a result our newest annual report is much shorter than normal, though it also goes some way to explaining why we felt we had no choice but to cancel the event. The report also outlines our plans to return with an event in 2018 which will make up for the disappointment felt by those teams who had been looking forward to taking part last year. Further details about our next event will be available in the coming weeks.